With Carrara 8.5 we now have the ability to work with the new DAZ Studio Triax rigged models. So for the most part, when I say: "Genesis" loosely, I'll be referring to any model using the new Triax. Carrara not only offers us a great way to now pose, animate, and apply shaders to Genesis, but we also have the power to be able to model support content for Genesis using Carrara's modeling tools! Like you've seen me do before, I'm going to begin by linking to DAZ 3D's "Publishing" page were you may peruse some very useful instructions on how to do many things for Genesis. Here, they not only discuss ways to make clothing and morphs for Genesis through the help of DAZ Studio Pro's Content Creation Toolkit, but also valuable information on how you may become a DAZ 3D Published Artist. Whether this is your intention or not, info useful to that is always useful in your own endeavors to make high quality items. You've modeled something to fit Genesis in Carrara and now you need to send it to DAZ Studio to make it into a conforming figure that follows any of Genesis' shaping morphs. First of all, save a copy of your file in Carrara format before continuing - just in the event that you need to get back to this point. I use My Carrara Browser for this. Now select your new model and go to the Motion tab in the instances tray on the right. At the bottom you'll see the controls for scaling. Since this just made your object slightly larger than 1% its original size, it has just seemed to disappear. This is the scale we need to use the Poser presets when exporting Wavefront OBJ files from Carrara. Now when you import this into DS, use the Poser import preset and you'll have the correct scale. I would like to test the DAZ Studio presets and figure out the needed scaling for this, too. But this is a scaling method that is tested and known to work. For other duties that you'll be doing to the obj file in DS and/or Carrara, we'll visit those in other posts and the DAZ Studio portions are discussed fairly in-depth in the Publishing page. These are explanations of the training videos featuring Phil Wilkes and include some great sample footage from the series. I strongly recommend these products unless you feel that you are an absolute expert at using Carrara. For our purposes in what we aim to do here, it is Advanced Carrara Techniques that will give you a wealth of information on modeling, UV Mapping, and all of the good stuff you need to know in order to use Carrara as a modeler. Highly entertaining and very useful. No matter your skill level, you'll enjoy this one. But if you're new to Carrara, and are still learning the basics, some of this might go over your head if you don't begin with Learning Carrara 8. He also gets fairly in depth on some really interesting Shader instructions. Like you've most likely heard me say before, I watch these over and over. I enjoy the show, and subsequent times through really helps to instill his lessons - there's a lot of them... Particles, too! The above information regarding scaling an exporting is well detailed in the Advanced Techniques as well. I haven't tried any of the tutorials in the following list, except where noted (will update as I do). I want to get a list going so that we have an index to work from, and anybody who has tried any of them might be able comment on them. If any of you know of some good, free tutorials on this stuff, please post links! Many, if not all, published artists that make conforming items for Genesis or make custom DS figures own some or all of these tutorials, and swear by them. At last-- a comprehensive tutorial on rigging original figures in DAZ Studio 4 Pro, covering every step of the process: grouping, rigging, assigning joint rotations and limits, weight-mapping, bulge-mapping, and adding ghost bones. The tutorial includes explanations of the various concepts involved, including understanding '3-D space' and joint rotation order. The tutorial is designed for all skill levels. Even if you're a complete beginner and have never rigged anything before, this tutorial will take you through the entire process, step by step, from ungrouped, 'raw' object to fully rigged and weight-mapped figure. The tutorial comes with a 'gingerbread man' model for you to use in following the lessons. (You can also use some other model if you wish.) The information is presented in clear, easy-to-follow steps, and accompanied by plenty of illustrations. 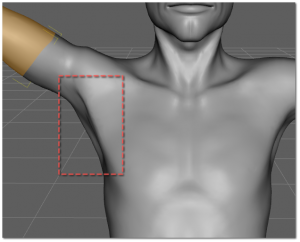 Whether you want to create an original, stand-alone figure, or create an add-on figures for geo-grafting, or just learn more about weight-mapping and adding ghost bones for use in clothing creation, this tutorial will teach you all the basics you need to know. The tutorial is in .PDF format, with bookmarks and table of contents. It's here at last-- 'Advanced Rigging in DS4 Pro'! There is also a complete section on geo-grafting, with step-by-step instructions for creating geo-grafts-- whether the graft in question is a simple pair of horns, or a replacement body-part that moves and poses-- as well as section on scale maps and on using ERC to create rigging adjustments to geo-grafts for specific figure shapes that are applied automatically when the FBM for that shape is applied to Genesis. The manual is profusely illustrated, and comes in .PDF format, with bookmarks and table of contents. Note: This manual is written with the assumption that you are already familiar with the basics of using the DAZ TriAx rigging system covered in Rigging Original Figures in DS 4 Pro â€”grouping, setting up â€œbones,â€ weight-mapping, etc. At long last! -- a tutorial on using the rigidity feature in DAZ Studio 4.5+!! Over a year in the making (because it took that long to collect enough information about the subject to write a tutorial on it), this tutorial explains what the rigidity feature can and cannot do, how to tell whether it's even needed, and most important, how to use it. Rigidity can be used to "protect" items such as buttons, buckles, and ornaments from being distorted by figure morphs transferred from the base figure to clothing. It can also be used to force add-on items such as scabbards and arm-mounted weapons to hold their shape. And, of course, where the rigidity feature really shines is in its ability to make geo-grafted items retain their shape, proportions, and rigging. All these functions are demonstrated and explained with step-by-step instructions and plenty of illustrations. This one uses Hexagon, so will likely skip some of the steps necessary in the Carrara workflow, through using the DS > Hex Bridge. See my notes below this list on this. This 99-page tutorial is a comprehensive step-by-step guide on how to create your own morphs for the Genesis 2 Female figure to use and sell. Each step of the process, from beginning to end, is explained and fully illustrated. It covers problems you may encounter and provides solutions on how to overcome them successfully in order to create your own morphs. This tutorial is designed for all skill levels from beginner to professional. Use it as a learning tool to develop your morphing skills, or keep it as a handy technical reference when you need to brush up on your skills. Have you ever wanted to make your own clothes? Think that it is too hard? Well I'm here to tell you that not only can you make your own clothes, but that you can make them with ease. This tutorial set is firmly aimed at learning by doing, instead of learning Hexagon then making clothes, you'll make clothes while learning Hexagon. Using the mesh template that is included in the package you will learn how to shape it into a shirt for Genesis. Using box modelling techniques to shape, refine and fit the mesh, then moving on to add details. Along the way you'll learn about:- Navigating in Hexagon Selecting polygons, edges and vertices Using symmetry Subdivision modelling Adding and deleting geometry Thickness Adding piping around the hem Mesh displacement with the painting tools Modelling seams Adding materials UVMapping Moving models between DS4 Pro and Hexagon Once you have finished the tutorials you will have a neat shirt ready to be set up in DS4 Pro, and more importantly the confidence and skills to make all kinds of garments out of the template. Again - another Hexagon tutorial, so we can expect that the bridge is used. Then it's into DAZ Studio 4 Pro where you'll set up your garment for Genesis, exploring how to fit a garment modeled on a Genesis shape instead of the base Genesis. Then going on to fix up an morph auto generated by DAZ Studio. You'll export the geometry, fix it up, then use it to replace the morph in DAZ Studio. Once all that is done you'll finish off the garment by adding subd and smoothing. Please don't feel 'put off' by a tutorial done in Hexagon. You'll find much of the same or similar workflow in Carrara. If questions arise from such, just ask and we'll tackle those issues as (if) they arise. The thing with the bridge is that we never have to worry about scaling or exporting or any of that. The DS > Hex bridge makes the transition between the two apps smooth as silk - which I like very much. However, now that I've started doing my modeling in Carrara, I like this workflow much better. Probably because I'm more used to Carrara and just feel more comfortable. Modeling over a base model in the Assembly room is an experience that just blows away any other cloth modeling I've ever attempted. Toward the top of this post I discuss exporting and scaling. That is the information you need to create your workflow without a bridge. It's really that small a difference. Please post a link if you know of any tutorials you may know of. If there is enough interest in this subject matter, this thread will grow and change as needs be. Also, if you have comments regarding anything discussed here, please feel welcome and encouraged to speak freely. I don't know if PokeAway 2! for Genesis 2 Female(s) fully removes Poke through in Carrara, but it looks nice. Lots of different dials for different things. And dialing one way changes the clothes, dial the other way to decrease the size of the Genesis body part instead, so you have a choice to either enlarge the clothing or reduce the body part... Quite the product! Load in which ever Genesis figure - but just the base. In other words, all morph dials at zero. Load on a good set of clothing that really shows off some horrible poke through - like, the worse example. Select Actor of that base Genesis (or Gn2) figure and click the little hand in the upper left corner to edit it's mesh. Go through the whole protected topology thing - turning it off. Now select a ploygon and turn on symmetry and soft selection. Leave the soft selection as high as it is and test for the right mount of influence and using the poke through as a guide, imagine how much bigger the figure would have to be fit to in order to eliminate the poke through. That came out awkward. Hmmm. Basically double, at least, the amount of poke through. We're not looking for uniform scaling here, nor are we worried about what poor Genesis is looking like - because you won't actually see this version. If you think thhat clothing, in general needs to be bigger 'in this spot', then sculpt the figure bigger in the right directions to get the results you want. What we're doing is pulling out the clothes where we pull out on Genesis. We just can't see that yet. When you're done, get out of edit mode and export that poor, weird-looking figure out as an OBJ. Use DAZ Studio preset (?) I'll get back to you on that one. I've always scaled down universally, in the motion tab to 1.042 and used the Poser preset. But I want to try the DS preset to see if scaling is required. Does anbody know? Okay. Now open DAZ Studio Pro and load in a fresh copy of the same Genesis model you edited, but before the editing. Load in the OBJ you made in Carrara as a morph onto Genesis using the Morph Loader Pro. The dialog that comes up is a nice worksheet where you give each yourself and your morph a name and then select what part of the figure is affected with this morph. For what we're doing in this example, we're going to open up the Genesis hierarchy, then Actor, Full Body and Stylized. This will place our morph below the dials for Victoria 5 or 6, depending, etc., on the Genesis figure. When you're done hit Accept. Now go to that folder on your computer. The place where you just saved that DUF. Copy the folder that it is in. Before pasting it again (in the same spot) rename the original to "Projected Morphs". Now paste the folder back. You should now have two folders in that location, with the same file in each. Go back into DS Pro and load in a new scene with a fresh version of the base Genesis you're using. Save As and save it in the exact place using the same name. Same as before, we're going to Save As > Support Assets > Morph Assets, open up the Genesis hierarchy, then Actor, Full Body and Stylized. "Overwrite the existing file?" "Yeah... Do it!" I mean... Yes. That said... whew. We can make all sorts of shape shifters! Five ways to fix poke through without using conforming figures which has a wealth of great information. Also, here's a tutorial in the store on the subject, not in Carrara. How many of you have already found the perfect shape, the perfect pose, the perfect lights and camera frame for a character, and suddenly, everything is compromised by a poke through in the outfit? You know, when the figure you're using "pokes" above its outfit... Most of you probably. I think I could say all of you. There are many solutions to this problem. The goal of this tutorial is to explain the many tools you have how to solve this problem, working on a concrete example, and using various techniques. This tutorial is divided in four video tutorials (resolution 1280x720). One for Poser users, one for DAZ Studio 3 users, one for DAZ Studio 4.5 users, and the last tutorial for all users since it describes how to remove your poke through once your image is calculated, using postwork in a 2D software. - Blender, a free 3D Software, and the morph loader to create a morph on your Posed Figure or on your Zero Figure, and the consequences of your choice. With all these tools, you will quickly be able to remove all poke through from your scenes - whatever the poke through you have and whatever the software you use! Before I move away from the topic of removing poke through, I'd like to mention that the above mentioned workflow for adding morphs to Genesis that don't affect Genesis' shape, but does affect whatever is conformed, can be a powerful way to add subtle enhancements to movements as well. It might be better to place movement morphs on the clothes themselves, as to keep from having just too many dials on Genesis. But with the new Parameters filters, it's really no big deal. If you've followed along so far, you've seen that, once again, I'm leading folks to read into all of the great new features that we have available as Carrara artists by including DAZ Studio Pro into our workflow. Well I'd like to just draw your attention, if I may, down to one of the more advanced topics: Joint Controlled Morphs (JCM). 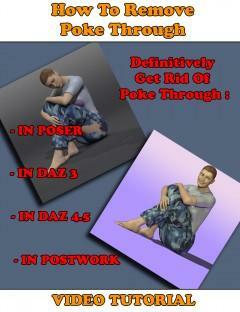 Personally I find these tutorials to be most generous of DAZ 3D to share with us. Yeah... they want folks to really get into this stuff and become better artists - and, hopefully, become published artists whom make great products for them. That's a great thing, right? Going through the page I've linked to above, you'll learn how easily JCMs can be installed. We can do this to our figures and also to the items that conform to them - giving us an incredible range of power. Awesome stuff. Don't you think? Like you’ve seen me do before, I’m going to begin by linking to DAZ 3D’s “Publishing” page were you may peruse some very useful instructions on how to do many things for Genesis. Here, they not only discuss ways to make clothing and morphs for Genesis through the help of DAZ Studio Pro’s Content Creation Toolkit, but also valuable information on how you may become a DAZ 3D Published Artist. Whether this is your intention or not, info useful to that is always useful in your own endeavors to make high quality items. Thank you. Very useful. I don't plan to be a published artist, but all of this information will help me in my own projects. Thank you. Very useful.My pleasure. I am convinced that learning these techniques will make Genesis (all versions of Triax - including the Triax animals and future figures) the best method of getting exactly the figures we want that we've ever seen. The biggest part that excites me is that, as I try some of these things, I find the sequence and operations to be simple and enormously effective! I don't plan to be a published artist, but all of this information will help me in my own projects. Too bad. I really think that you have what it takes to turn out some excellent products - as with many others whom frequent this forum. Who knows, maybe you'll create something for yourself and feel that it would make a beneficial addition to the store? That's how it begins for many of us. My Starry Sky and EnvironKits are essential to my workflow for various animation scene creations - which is how I developed them. I'm glad I went the extra mile on them to turn them into a professional product, as it makes them ultimately more useful for me as well, in the end. Thank you .....the Winterbrose tut looks amazing along with all your other fantastic material. I struggle with losing morphs eg for V5 if I try to go into Hex and then back to Carrara. Hope going the DS route will solve that??? I know the perfect thing for that! Save right to the library, a new morph for Genesis. Then when you load Genesis in Carrara, you'll have the morph dial. These instructions from DAZ 3D are pretty decent. I'm learning a lot from messing around with this stuff. ...Not sure if this is the correct thread to address this in as it is more of a general modelling question. While I understand the basic procedure outlined above for saving a model created in Carrara as a .obj to import into Daz Studio, my concern is over UV mapping. Does the UV map carry over with the ,obj or do I only get an unmapped version with no material zones when I import it? 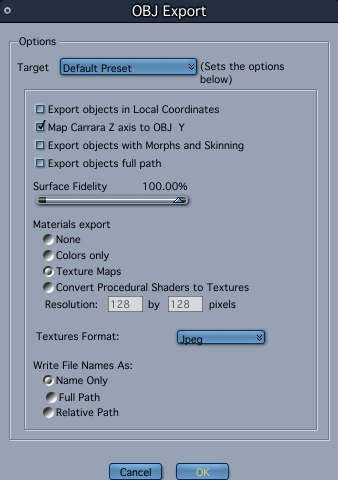 Second, does Carrara have the ability to perform UV unwapping for creation of texture templates? I have found Hexagon to be just too unstable for my needs and am looking for an alternative for modelling that doesn't cost several months to a half year's rent or require the equivalent of a graduate course in cryptography to figure out its UI. ...Not sure if this is the correct thread to address this in as it is more of a general modelling question.Absolutely... Let's discuss away, shall we? Yes. If you've ever mapped out, unwrapped, whatever with UV maps on mesh objects, you'll enjoy the ability of all that stuff in Carrara - even if you're modeling (editing) in the Assembly Room. Define your seems and, if you wish, apply some pins and unwrap away. You may also export the map template in your chosen respolution. It helps, sometimes, to divide the model into material zones so that you can map directly on that selection. Here's the UV Edit mode view. The right window is where you map the template, left is a view of the object. 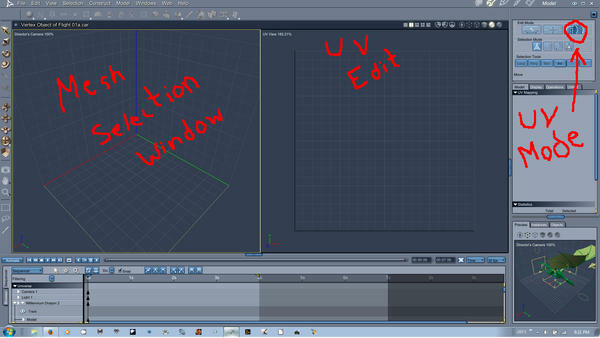 Edit: To get into UV edit mode, use the button I circled in the upper right of the interface while in the modeling room, or object edit mode in the assembly room. Some of this is carried through in the How to export from Carrara 8.5 to Daz Studio 4.5 topic. ...thanks. As I already know my way around Carrara fairly well it will make this a lot simpler to learn. So do the Material zones save with the .obj as well? Yes - there may be an option to exclude them - but I can't remember if that's during import or export. One thing to know is that, if you have the DAZ Studio CCTs transfer utility change the mesh into Triax, it will create its own rigging zones for weight mapping - but your material zones should still remain unchanged. If you select, None in the save options it won't. I noticed in C7.2 Pro, that when converting procedural shaders to image maps it seems to just bake the color data. Not the noise or other procedural functions. Bummer! Maybe this was improved upon in C8 and later? I noticed in C7.2 Pro, that when converting procedural shaders to image maps it seems to just bake the color data. Not the noise or other procedural functions. Bummer! Maybe this was improved upon in C8 and later? Bummer. I have "Baker" from Inagoni's Advance Pack of Plugins. I have yet to use it, but I think that will actually 'bake' the results as you'd like. ...sweet. I just mainly net the material zones as I can do all my texturing and shader work in Daz Studio. This way a zone that needs to be transparent (like for windows) is already there. Surface Baking, sometimes call skinning, is the transformation of an object procedural texture, lighting or surface definition into a traditional texture map. Baker adds these possibilities to Carrara. Using the UV mapping of an object, Baker can extract flat texture maps from any Carrara's shader, giving then the possibility to rework it in other traditional 2D software. You can now start shading an object with any Carrara procedural shader, either 2D (UV mapped shaders) or 3D (solid shaders) and then add details to it in your favorite 2D software. Baker can also bake lightmaps and normal maps: rendering time can be dramatically lowered by using these technics usually used in real time rendering applications. These maps are also very useful to enhance 3D characters modeled for video games. 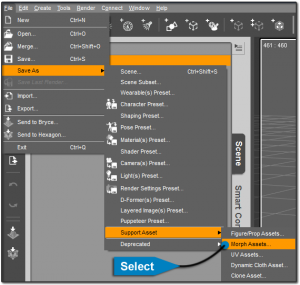 To bake an object shader, select first the object in the scene, then choose the menu item Edit->Baking or press Ctrl+F. Note that several objects can be selected at the same time: Baker will generate as many maps as there are selected objects. 3 types of map can be exported. The first one, the Texture Map, transforms one of the shader's channels into a texture map. Look for example at this vase model. 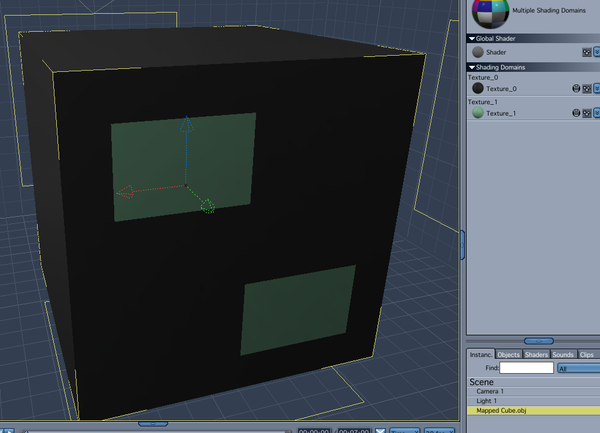 Its shader is made of 3D solid textures, one in the diffuse channel and another in the bump channel. To transform the shader's channels into texture maps, first be sure that the UV mapping of the object is accurate. Baker uses the UV map to transform 3D shaders into 2D texture maps, so if the UV mapping has flaws, like overlapping triangles, these will be visible in the baked map. Then in the Baking dialog, select the Diffuse and the Bump channels. The background color is used for unassigned pixels (the UV mapping might not cover all the UV space). 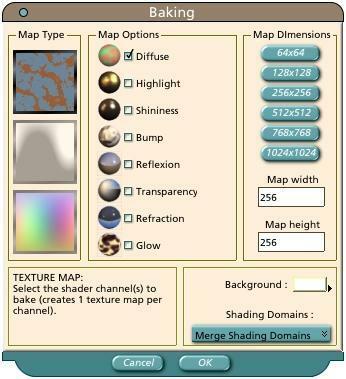 If the object has several shading domains, 3 options are available: you can choose to export all the domains into 1 map (Merge Shading Domains), to create a different map for every shading domain (Separate Shading Domains), or to export only 1 of the domains by selecting it in the popup menu. These maps can then be used as traditional texture maps with the vase shader to speed up the rendering of the object. The second type of map Baker can generate is the Light Map. The light map is created using the current scene lighting and rendering engine. For versions previous to Carrara 7, the rendering engine is limited to raytracing. But Since Carrara 7 version, Baker can capture any kind of rendering. For example, the caustic effects generated with the Global Illumination render can be baked in a texture map. The 3rd type of map is the Normal Map. The normals can be computed with or without the bump mapping, and can be determined in global or local space. To read normal maps, Baker includes a special shader named Baker Normal Map. This shader is available in the shading room in the Tools shader category and can read any kind of normal map. A Normal map can be used to store some geometry complexity from a model and reinstitute it as a bump map to a lower resolution one. This way the final object is much faster to compute during rendering time. Here the first rendering was done with a real geometry, the second with a low polygon version of the object and a normal map that countains the details. Because Baker Normal Map shader can read any kind of normal map, it can also read ZBrush normal maps. To read a ZBrush normal map, select the Mirrored option in the Normal Map shader. This type of map create very realistic bump for still object. To animate an object, this normal map need to be converted into a Relative normal map (using Edit->Baker and choosing the Relative option for the normal map). Baker is available in demo version here. The demo version is full feature with a baking size limited to 128x128. The Deeper Normal Map shader and the Baker Normal Map are similar but Baker's is more powerful. Deeper's shader reads only relative (tangential) maps: it uses the information contained in the map to perturb the existing normal on the object. Baker Normal Map can reads relative or global normal map. The global one simply replaces the object's normal by the one contained in the texture. The object normal information are completely erased and a new normal extracted from the map is used instead. OMG, I am going to love the fact that I now own Baker!!! I haven't made it to texture map phase yet - this will help immensely! ...Daz 4.6 also has a Shader Baking function s well. ...agreed, more intuitive than either Poser's Material Room or Daz Studio's Shader Mixer. 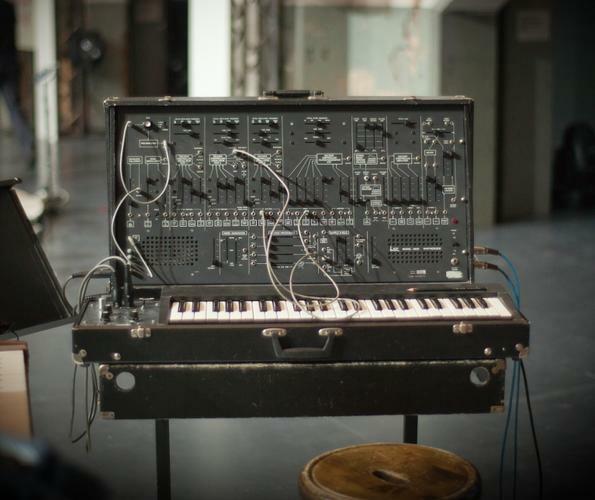 The last time I used "patch cords" was with an old Arp 2600. Would it be possible to export one of these cities including textures to DAZ? I assume the city would be exported as an obj but what about the textures? I'd like to use Carrara but I need to render in DAZ with Octane Render. If I could create the city in Carrara and then export it to DAZ that would be ideal.